While the overall hobby reaction to 2011 Playoff Prime Cuts Baseball has been mixed, early realized prices on eBay show some very strong sellers, particularly among memorabilia cards from early legends. So far, two cards have passed the $1,000 mark with another falling just short. 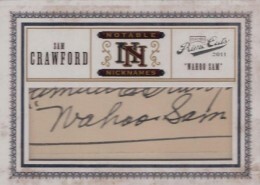 Two other cards that are still listed have also passed $1,000, including a Lou Gehrig cut signature, jumbo jersey book card that is already over $2,400. 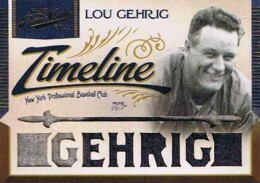 A Gehrig Timeline 1/1 patch card went for $1,950. The card has a grey and black swatch displayed with a window cut to his name. From the Gehrig to the next block of high sales, the gap is large. 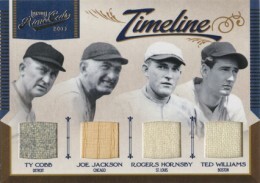 A 2011 Playoff Prime Cuts Timeline Quad Memorabilia card featuring Ty Cobb, "Shoeless" Joe Jackson, Rogers Hornsby and Ted Williams closed at $1,025. 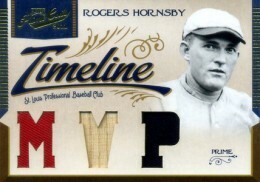 Both the Hornsby and Williams swatches are multi-color patches. 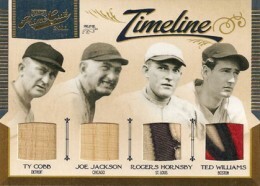 Another copy of the card, which is numbered to 5, sold for $999. A couple of more recent players also cracked the list of early 2011 Playoff Prime Cuts top sellers. 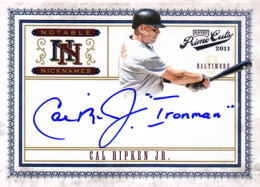 A Notable Nicknames Cal Ripken Jr, which has the inscription 'Ironman' and is numbered to 25, changed hands at $720. 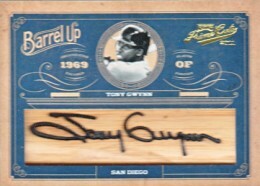 A 1/1 Barrel Up Tony Gwynn sold for $601.01. 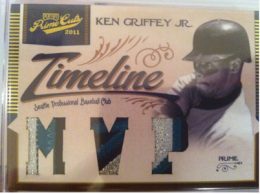 Proving the ongoing hobby love for Ken Griffey Jr, the Seattle great has two cards on the list. 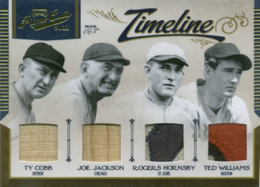 A 2011 Playoff Prime Cuts Legend book card numbered to 10 that has both an autograph and a jumbo jersey swatch sold for $407. A 1/1 triple patch Griffey went for almost as much, falling a penny short of $400. If nothing else, this list demonstrates that 2011 Playoff Prime Cuts is a high-risk, high-reward type of product. It's high initial price tag may not be for everyone. But for hit seekers more interested in autographs and memorabilia from earlier generations than logos, there are some very intriguing options. 2011 PRIME CUTS FRANK ROBINSON 8X JUMBO JERSEY PATCH RELIC 25!!! HOFER LEGEND!! 2011 Playoff Prime Cuts Timeline Jimmy Foxx SICK QUAD GU BAT PATCH RELIC 5 5 !! Hi Ryan! Love your site! 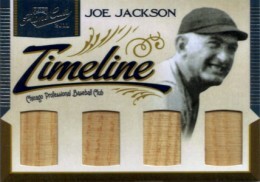 Do you know anyone who has this joe jackson 4 piece bat card?